Search engines can drive in a lot of traffic to your website so it is always better to get your website listed on major search engines of this world. The top three websites where you surely want your site to get listed are Google,Yahoo and Bing. The search engines provide an easier way to notify them of your website and they automatically list your site after crawling and indexing your website with the help of automatic crawling software known as Robots. Yahoo results are powered by Bing so you need to submit your website to Bing in order to get listed in both Yahoo and Bing. Note:- Alta vista is now owned by Yahoo so you don’t need to submit your site in it separately. 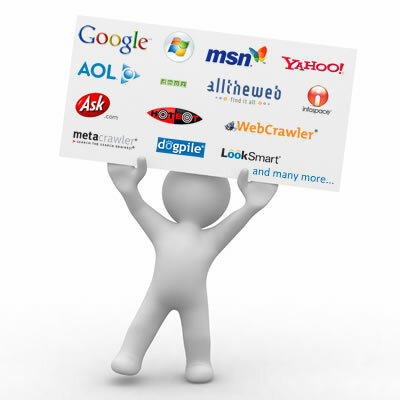 You may use the softwares and tools listed below to submit your site to the hundreds of other search engines. Want only listing or specific keyword listing? This is where the BIG question arises as whether you want a simple listing for your website where your website shows on keywords related to your company name only or you want to display your site on more competitive keywords related to your industry. The latter becomes possible with the help of a technique called search engine optimization. Seo makes the site more search engine friendly and helps your website to gain more backlinks and link power to help it rank higher on search engine result pages. There are some guidelines which every webmaster must follow in order to get the best listing of their website on the search engines. While creating web pages on your site, make sure to give them a user friendly readable file name and not any awkward name which are harder to recognize. Semantic file names helps search engines to find out what the web page is about. An example of semantic file name would be www.example.com/search-engine-submission.html while an awkward file name would be www.example.com/hf4567.html . This clearly indicates that creating a semantic url is a much better approach to follow while creating web pages. Search engines make use of the title tag while ranking web pages, therefore you must use unique title tags for every page of your website. The title tag should describe the main contents of the webpage and must contain the keywords. It is better to use the keywords at the starting of the title tag. But make sure to keep the user’s in mind while writing the title tag as tags created solely for search engines get penalized. The title tag gets seen on the search engines so keep it user friendly as this will help to increase the click through rate of the website.The title tag has a limitation of 70 words. The description tag consists of words that unique describe the contents of the web page. It has a limitation of 150-170 characters. The description tag also gets showed up in the search results so it is better to follow a marketing approach while writing these tags. You may use your main keywords here. Sitemap.xml helps the search engines to find inner pages of a website. It eases the crawling process and makes indexing easier. For new websites and for websites which updates often, it is recommended to submit sitemap.xml to the search engines on a regular basis. You may submit the sitemap.xml to the search engines after signing up for the webmaster tools. Keeping the user as well as the crawlers in mind, you must create a sitemap.html which would help to identify the pages of your site in an hierarchical manner. This approach is beneficial for both the user as well as the search engines. Google and Bing being the top most search engines of this world, provides a set of free tools for the webmasters which helps them to keep tracks related to their websites. These tools contain data related to your site and you can find out important search queries, internal links, backlinks, malware and other information etc from these tools. You may submit your sitemap.xml with these tools as well. Google analytics is the most sought after tracking tool for your website. This tool is completely free and allows you to track visits to your website . This tool displays data related to number of visits to your site, the geographical location of the visitors, browser information, the time spent on site, percentage of returning visitors, the bounce rate of the site etc.